Approximately 2 months ago Glenn Beck predicted that we would begin seeing "Occupy Wall Street" (OWS) merchandise in the mainstream. Tonight on the X-Factor, contestant Chris Rene wore Jay Z's "Occupy All Streets" t-shirt during his performance on live TV. Sales from Jay Z's t-shirt are not profiting OWS (at this time). They are profiting Jay Z, much to the chagrin of many in OWS. Capitalism is alive and well...and, Glenn Beck is right, AGAIN: Hollywood is playing its part in helping to bring OWS into the mainstream...on prime-time television. 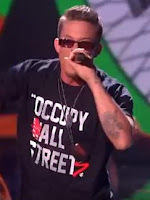 "X Factor US Top 10 : Chris Rene Rock Song Performance No Woman"
Hopefully, Chris will be voted-off next week. If you wish to be notified of my future blog posts, please subscribe to my blog via the "Follow by email" box near the top of this page. I will not see your email address, or even if you subscribed. You will NOT be spammed. If I make 10 posts in one day, you only receive ONE email. Thanks!